Sheffield United need to prove they can last the course, Jordan Hugill must show he's the man for Middlesbrough and Luton are flying in League One. Can Sheffield United last the course? This is, to all intents and purposes, the time when the wheels came off for Sheffield United last season. The Blades had just beaten Burton 3-1 in their 17th game of the season to move back above Wolves to the top of the Sky Bet Championship table, but from there it all went downhill. United would lose their next match 5-4 in a remarkable clash with Fulham at Bramall Lane, before going on to lose four of their next five. A home win against a dreadful Sunderland side was their only victory between their 17th game and their 28th. Chris Wilder's side have six fewer points than they did at this stage last season, but in many ways they also look stronger. They face winnable trips to Rotherham, Brentford and Reading in the next few weeks, while they also have tough home games against Leeds and West Brom. The frustration of failing to see off Sheffield Wednesday has hung over them throughout the international break, and they will be desperate to win at the New York Stadium on Saturday lunchtime, live on Sky Sports Football, to prove they can last the course this time around. Is Hugill the man for Pulis? There is no doubting Britt Assombalonga's scoring prowess in the Championship, it is just the other parts of his game that can often cause concern. Jordan Hugill is perhaps at the other end of the scale. The work-rate is there but the finishing can be wayward, at least it was until he scored both goals in a 2-0 win over Wigan before the international break - albeit with the first coming from the penalty spot. "In pre-season he got an injury, so he hasn't really done anything for six months," explained Boro boss Tony Pulis after that double. "He came here really cold, his fitness levels were nowhere near those of the rest of the group. "But he's worked really hard and, in the last few games, we've seen some good signs. The players are delighted for him because he's such a good lad around the place. He works so hard and he's got his qualities." If Hugill can continue to add goals to his game then he could become just the man that Pulis requires to spearhead their promotion push. A trip to Brentford on Saturday evening, live on Sky Sports Football, will give the striker another opportunity to stake his claim as Boro's leading man. Anyone hoping that Millwall would have been able to kick on from their incredible finish to last season will now know that it isn't always so easy to take that momentum through a summer break. The Lions are only two points worse off than they were at this stage in 2017/18, but the rise in expectations hasn't transformed onto the pitch so far. Millwall striker Steve Morison and former Ipswich manager Paul Hurst join David Prutton in this week's EFL Matters. "You have to realise where we are as a club," said Steve Morison, the Millwall striker who appeared on EFL Matters on Thursday. "We do in the dressing room and the management do as well. "We need to get to 50 points and once you get there you can roll on. The expectation has grown from outside because of how well we finished the season, but within the club we aren't stupid and we know where we are." Bolton have failed to win any of their last seven games and have scored just once in that time, providing ideal opposition for Morison and Millwall to get back to winning ways at The Den on Saturday. It is always great to see a club getting back to where they feel they belong after so many years of struggle, and that is exactly what Luton are doing under Nathan Jones. A decade of desperation at Kenilworth Road that saw them drop from the Championship to non-league is well and truly on an upturn, and a recent run of form has seen them push right up into the promotion battle in Sky Bet League One. 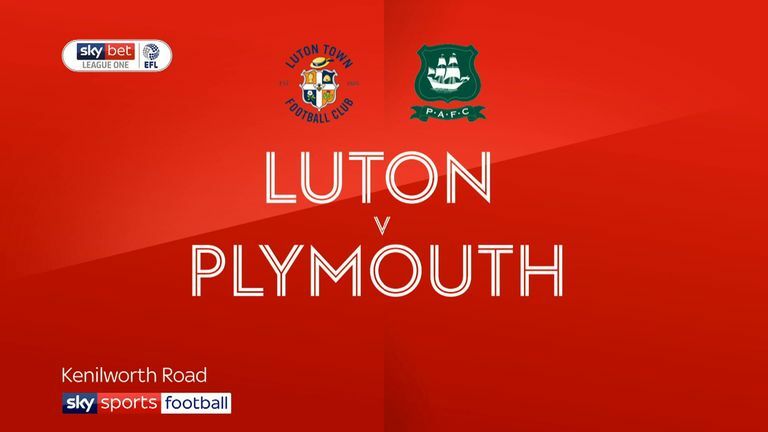 Highlights of the Sky Bet League One clash between Luton and Plymouth. Their performance as they took Plymouth apart last weekend was nothing short of superb, as James Collins scored a hat-trick in a 5-1 win. And Jones didn't exactly downplay the performance. "I have got to be honest with you, the first half display is as good as I have seen," he said after the game. "I could wax lyrical about it - the football we played was something to be really proud of. "Me and my staff work long hours to achieve something like that. I am not getting carried away, I am not over eulogising in any kind of way, but I thought we were wonderful, we were absolutely scintillating - the passing, the movement." The Hatters are six points off leaders Portsmouth heading into the weekend, and head to Gillingham on Saturday in the hope of closing that gap further. Onlookers would have been stunned to see that Harry Kewell couldn't completely revitalise Notts County's playing style, while also turning around a dreadful start to the season within six weeks of arriving at Meadow Lane. Having inherited a playing squad that was designed with specific intentions by Kevin Nolan, results briefly improved after Kewell's appointment before nosediving again, leading to the Australian's dismissal. 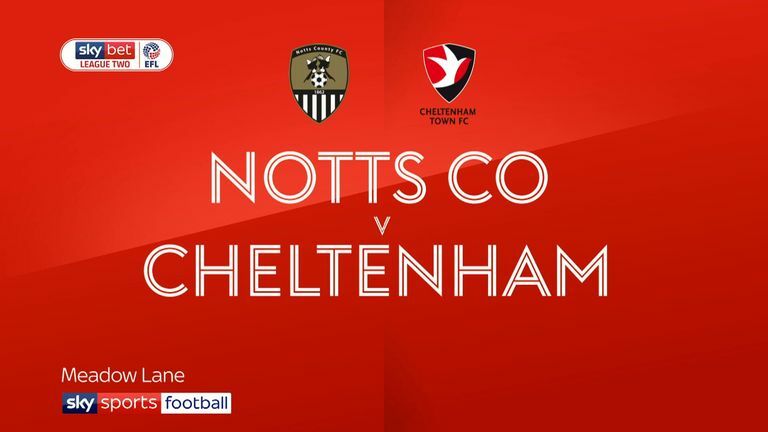 Highlights of the Sky Bet League Two clash between Notts County and Cheltenham. Not that it helped a huge amount. Their most recent game, while managerless, produced probably their worst result of the season so far, losing 3-0 at home against Cheltenham, one of only two teams that were lower than them in the table. After 18 games of last season Notts County were top of the table, and now they find themselves second bottom and in the drop zone. They are well and truly in a relegation battle, and a defeat at Morecambe on Saturday with a real uphill battle for Neal Ardley to climb, when he takes over next week.